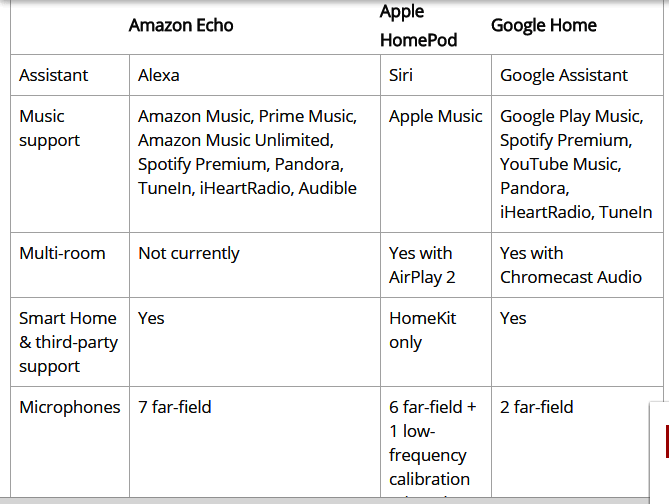 Home Assistant: A look at the Amazon Echo, Google Assistant, and Apple HomePod. Apple recently introduces their home speaker – the Home Pod. Siri has been dominating the Apple products as the personal voice command. Now Siri has become part of the Home Speaker joining rival forces with Echo and Google Assistant. But how will the HomePod beat the already market established Amazon Echo or Google Home speakers? Apple needs to do better with Siri in the realms of meeting the consumers’ needs and expectation. Voice assistant needs to get a lot of skills in its database as well as get smarter in connecting to our smart homes and daily human queries in a conversational, fun and smarter approach. Understanding that Google has a rich source of information for its Google Home assistant from the Search engines is great for Google Assistant. But Amazon Alexa has thousands of skills being added every time for it to get smarter. Will HomePod takes the lead in music? Apple leads in music with its Apple Music store. You get to enjoy millions of music with HomePod speaker. HomePod is very smart in this. Alexa has third party music sources just like Google Home. The design of each of the home speakers varies. It seems that HomePod is more advanced in sound technology to make your room full of smart music sound. It has a credible speaker system that works to bring you’re the seamless sound you like from any music you select from its store. HomePod offers up a superior looking speaker setup to its competitors, Google home has a rich base, unlike Echo speaker. On the other hand, Google Home is far more advanced in conversation. For example, if you asked Google Home speaker “who is the current president of the United States?” it gives you the correct answer. Going further I ask “how old is he?” then it understand the path you’re going and answer it perfectly. Hey Google, How old is he? There are some other scenarios where Amazon Echo takes the lead from Google Home. Google home also has the great capability to stream your videos or music to your TV through Google Home Cast. Then it uses YouTube as a means to play you music from your TV. We are yet to determine the case of Apple HomePod when it’s available for the public this December. We eagerly anticipate this release. Stay in touch for other great news in regards to Amazon Echo, Google Home, and Apple HomePod. Ay, Have a look at this Chart comparison of the three. macOS Sierra vs Windows 10: Why Microsoft Lose?